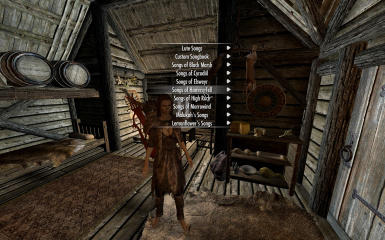 Become a Bard 5.0 lets you play all of the instrumental and voiced songs included with the game or choose from dozens of new songs. 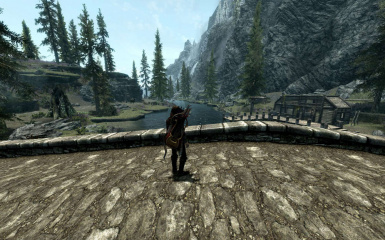 Adds new radiant quests to expand the options for a bard in Skyrim. This is an old, unmaintained version of this mod. The latest version for Oldrim can also be obtained from Steam. Tired of being a warrior or mage? Become a Bard! 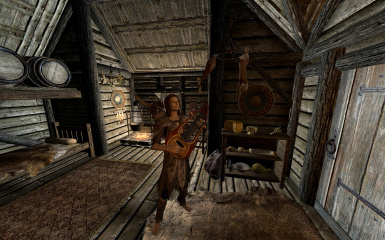 Become a Bard lets you play all of the instrumental and voiced songs included with the game or choose from dozens of new songs. 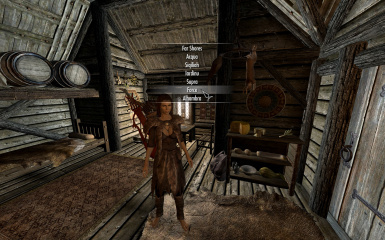 It also adds new radiant quests to expand the options for a bard in Skyrim. For those who are updating, what is new in 5.0? Added enhanced, consolidated songbook menu that shows songbook titles and song names. This is something I've always wanted to do, now made possible by expired's UIExtensions, available here: http://www.nexusmods.com/skyrim/mods/57046/? This option is in the MCM, but will not be available without UIExtensions installed. This took a lot of work on the guts of the mod, because I was adamant that the new menu work seamlessly alongside the old functionality, which does not require SkyUI or SKSE. 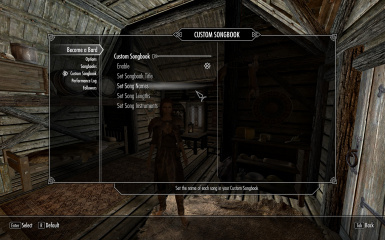 Added ability to rename the custom songbook and the custom songs via the MCM. This was made possible by SkyUILIB by mrpwn. NPC dancing is now disabled by default. For an existing playthrough, your current setting will be retained. This is because the dancing is pretty cool/funny once or twice, but after that not so much. You can still enable it in the MCM if you want. Music increases speechcraft skill is now disabled by default. For an existing playthrough, your current setting will be retained. You can still enable it in the MCM if you want. Still fully compatible with anything that changes skill trees or perks. The vanilla skills and perks are not touched in any way. This mod is designed to only add functionality, not to change existing functionality in any way. 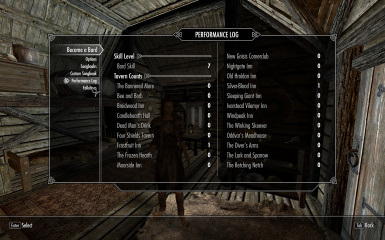 For those new to Become a Bard, what is this mod all about? TIP: Check out all the other videos under the videos tab. They will give you a good sense of what to expect. The songs that you can play just from picking up an instrument are fairly limited. 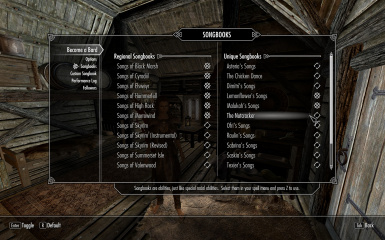 You can purchase additional songbooks from Viarmo at the Bards College in Solitude. 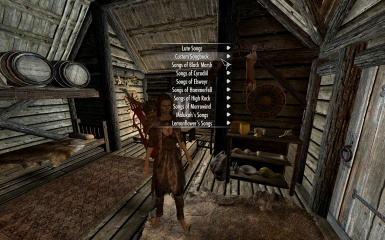 To play a song, equip the musical ability in your spell menu. Press Z to use the ability, just like you would with a shout. 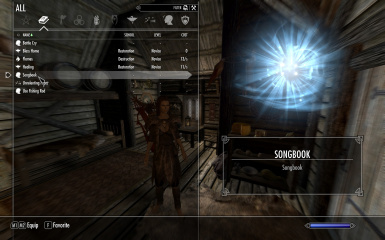 You can add your own songs and play them in-game using the Custom Songbook. Each time you perform, your Bard Skill will increase. This is tracked in your Bard Journal in the MCM or (optionally) in your inventory, not in the Skyrim skill/perks menu. Your follower(s) will play along with you to any song with two parts. (You can tell by ear if a song should have two musicians.) 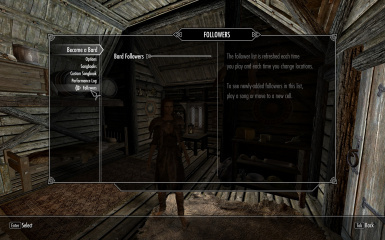 You can manage your followers and set whether or not they are a bard in the MCM. NPCs around you will react when you perform. If they are not otherwise occupied, they will stop and pay attention to you. They will clap afterward. This will be sort of a sarcastic slow clap at first when your bard skill is low, and will gradually become more enthusiastic. You can go up to any innkeeper and tell them you would like to perform. The tips will be minimal (10-25 gold without perks), but it should be enough for a meal, and you also get a free room for the night. 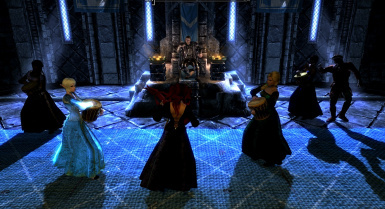 Once you earn one of the bard perks (see below), you can request to perform for a jarl. Jarls do not pay money, but if they like your performance there is a chance they will give you a gift (random small enchanted item). If you complete the Bards College quest line, your Bard Skill is high enough (50 or higher), and you have earned one of the bard perks described below, Viarmo may have additional work for you. No spoilers here. Optionally, each time you play, your Speechcraft skill will increase. This is configurable via the MCM (requires SkyUI). A wearable lute is included. It can be crafted at the forge using a regular lute and leather strips. It can sit far or close to the back, configurable in the MCM. The volume of your songs is adjustable in the normal Skyrim options menu under Audio. Adjust the very last slider, Player Songs. Once you start playing, you can stop playing at any time by pressing the "Z" key again. 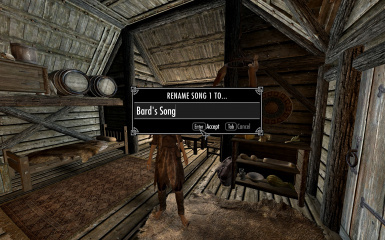 With the 5 default bards songs, such as Ragnar the Red, etc., you will have to wait until the current verse finishes. Also, if you stop before the end of a song, you won't get the skill increase. Experienced Bard: Earned by performing in taverns at least 15 times. Pay from performing at taverns increases (2X base). Well-Known Bard: Earned by being an Experienced Bard and performing in at least 10 different taverns. Pay from performing at taverns increases (4X base). Replaces Experienced Bard. Renowned Bard: Earned by being a Well-Known Bard and having Bard Skill of at least 100. Pay from performing at taverns increases (8X base). Replaces Well-Known Bard. 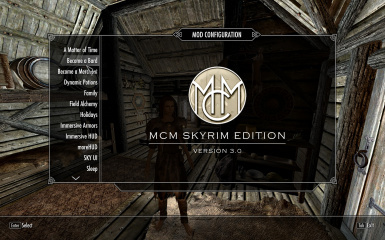 The MCM referred to above is the mod configuration menu from SkyUI. SkyUI and SKSE are not required, but they are recommended. Some options will be inaccessible without the MCM. If you like the music you can play using this mod, you can find more by the artists by clicking the links below. Jon Sayles -- I would especially like to thank Jon for his very generous permission to use tons of his work in this mod. If you have an interest in early music, you should definitely spend some time checking out his web site. Some of the videos under the Videos tab show what you can do with the Custom Songbook. If you have difficulty, see the detailed instructions and Help Forum here. Also, check out the Become a Bard facebook page maintained by Speziax. Download MultiXWM from the Nexus: http://www.nexusmods.com/skyrim/mods/3159/? Unzip the contents of the archive file to somewhere convenient, such as your deskop. TIP: If you do not extract the files and try to run the program from within the zip folder, the program will not work correctly! You will get no output! Open the folder you extracted, and double-click MultiXwm ver.1.3. Click on the Add File(s) button and select the file(s) you want to convert. The files you select must be in wav or mp3 format. TIP: If you are converting an mp3 file, the file extension MUST be in lower case in order for the program to recognize it. In other words, it must be .mp3, and it cannot be .MP3. Click the Start button with the MultiXwm program, a bit below the Add Files button. Within the folder you extracted to your desktop, open the output folder. Your xwm files should be there. Rename the xwm files to Custom01.xwm, Custom02.xwm, etc. 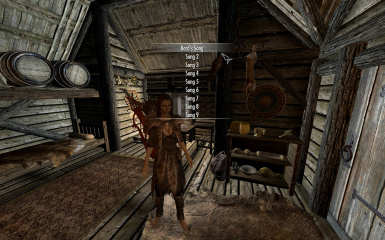 Create a new folder at Skyrim\Data\Sound\FX\Mus\Bard\Custom. You may not have these subfolders, starting with the Sound folder. 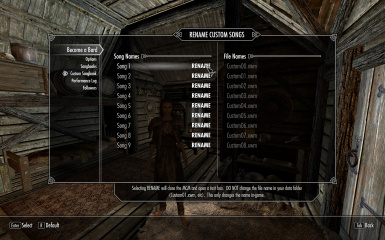 Create any additional folders you need to get to Skyrim\Data\Sound\FX\Mus\Bard\Custom. TIP: The root Skyrim folder referred to above is your Skyrim game folder. For example, I have Steam installed on my D:\ drive. So, my Skyrim game folder is at D:\Steam\steamapps\common\Skyrim. Your Skyrim folder may be at C:\Program Files\Steam\steamapps\common\Skyrim or somehwere similar. Drop the Custom01.xwm, Custom02.xwm, etc., files into the Custom folder you just created at Skyrim\Data\Sound\FX\Mus\Bard\Custom. 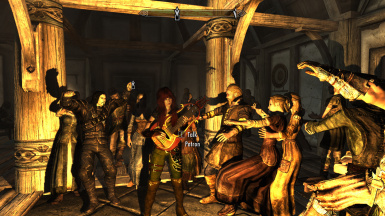 You are ready to rock out in Skyrim! CAUTION: Using very long songs can cause Skyrim to crash. I have never had any issues with songs shorter than 5 mintues.